Essential Oils of: Vetiver, Lemongrass, Tea Tree. It has natural Preservative of TCLS. It is chemical free product. Swirl the brush in the soap box and apply on a wet face. 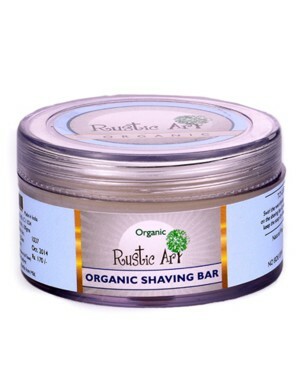 With goodness of Grape Fruit Seed Oil, Olive Oil, Coconut Oil, Neem Oil and Lemon Oil. This is a unique shaving bar which is completely organic and gives a smooth finish. Swirl wet shaving brush over the surface of the soap. Lather wet face. Use Rustic Art Aloe Vera-Tea Tree after Shave Gel for best results. Keep the soap dry after use.